Time Well Spent: Choosing an IRA or a Restaurant? Actually both can be a good use of your time in the right amount. Living near a major city like Chicago, the dining choices are innumerable. The worst that can happen is you have a bad meal should you choose the wrong restaurant. Contrast this with choosing the wrong place for your IRA account and/or the wrong investments and you may end up with less in retirement than you had hoped for. Americans are more likely to spend two hours selecting a restaurant for a special occasion (25 percent), buying a flat screen TV (21 percent) or tablet computer (16 percent) than on planning an IRA investment (15 percent). Fewer than one in five (17 percent) Americans are contributing to an IRA – a decline from 22 percent in 2012 – potentially missing tax and savings benefits. What’s more, fewer than half (47 percent) of those not contributing say they would consider an IRA, down from 57 percent in 2013. 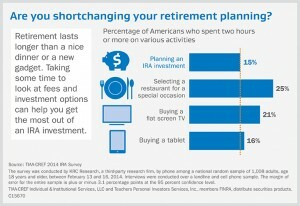 Even among those who already have an IRA, more than half (55 percent) said they spent an hour or less planning for the investment. “An IRA can be an incredibly powerful savings tool that can boost retirement security and offer immediate tax and savings benefits. IRAs can also serve as a valuable supplement to an employer-sponsored plan and help fund a first home or education,” said Doug Chittenden, Executive Vice President, Individual Business at TIAA-CREF. Despite these benefits, the survey found that fewer than one in five (17 percent) of those surveyed currently contribute to an IRA, a decline from 22 percent in 2012. The survey reveals that the number of Americans who would consider an IRA as part of their retirement strategy has fallen sharply since 2013. 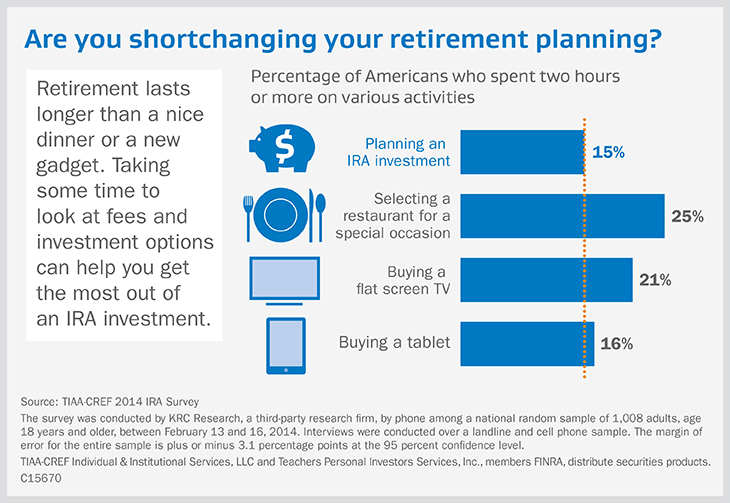 Fewer than half (47 percent) of those not contributing say they would consider an IRA, down from 57 percent in 2013. It is possible that a lack of understanding is responsible for low IRA contribution levels. More than one-third (35 percent) of respondents do not understand what an IRA is or the difference between an IRA and an employer-sponsored plan. This percentage is even higher among the Generation Y (age 18-34) population surveyed (45 percent). Sixty percent of those who are contributing to an IRA also have an employer-sponsored plan such as a 401(k) or 403(b). Among those with both plans, more than half (53 percent) say they contribute to their IRA regardless of whether they have reached the contribution or matching limit of their employer-sponsored plan. This means they could be leaving money on the table if they are diverting money to their IRA before contributing enough to get their employer match. How does an IRA fit with my retirement planning strategy? TIAA-CREF is absolutely right in that an IRA can be a great tool in your retirement planning strategy. If someone has access to a 401(k) or similar workplace retirement plan I generally suggest they contribute at least enough to capture any employer match offered. This is true even if their 401(k) plan is lousy. Beyond that it makes sense to contribute more than the amount needed to receive the match if your employer’s plan offers a menu of low cost solid investment choices. Although 401(k) plans receive a lot of bad press, in fact there are many excellent plans out there. One advantage to investing for retirement via a workplace retirement plan is the salary deferral feature. This makes regular savings and retirement investing painless. You don’t have access to a retirement plan via your employer. You have maxed out your contributions to your 401(k) and want to make additional retirement contributions. You are a non-working spouse and your working spouse makes at least income to cover the amount of your contribution. You are self-employed. Note there are a number of retirement plan options for the self-employed including a Solo 401(k) and SEP-IRA. You are looking to roll over your 401(k) after leaving a job and also possibly to consolidate several old 401(k) plans in one place to make managing these assets a bit easier. How much will the account cost me? Is this IRA custodian a good fit with my investing needs? Should I roll my 401(k) to an IRA or leave it in my old employer’s plan? How much is it to trade stocks, closed-end funds, ETFs or other exchange-traded vehicles? Does this custodian offer a large number of mutual funds on a no transaction fee (NTF) basis? While researching a good restaurant can take some time and potentially yield some tasty rewards, time spent on finding the right IRA and on retirement planning in general can pay off handsomely down the road. This can lead to many fine restaurant meals as well. As we head toward April 15 it is now high IRA season for the major brokerage and financial services firms. You will undoubtedly see many TV commercials and ads by these firms touting the benefits of opening an IRA with their firm. Here are 3 things to consider as you evaluate your best IRA account options. Some firms may charge a fee just to have the account. This might be on the order of $25 or $50 annually. If your balance is relatively low this can be a significant bite. Sometimes these fees are based on the size of your account balance. Additionally you will want to understand any and all transaction fees. This might include trading fees for buying and selling stocks, ETFs, or other exchange-traded investment vehicles. Certain mutual funds might carry a transaction cost as well. If you are working with a commission-based financial advisor understand how he or she is compensated. Will the funds in the IRA account they are advocating carry sales charges or high internal fees to compensate them? Is this custodian a good fit with my investing needs? This runs the gamut. Certainly the fees mentioned above are part of this. Beyond this look at how you invest and the vehicles in which you invest. For example if you use ETFs extensively does this custodian offer any commission-free ETFs? If so are these the ETFs that you would use? As an example if you were planning on using Vanguard mutual funds exclusively it might make sense to house your IRA there. On the other hand if you were looking to use funds from a variety of families perhaps a custodian that is more of a fund supermarket like Schwab or Fidelity is more appropriate for you. Beyond an IRA account is this custodian a good fit for my needs in terms of other types of accounts such as a taxable brokerage account? Do they offer the full array of services that I might need? In my experience having an IRA at one custodian plus other accounts scattered around several other custodians is rarely a good idea. 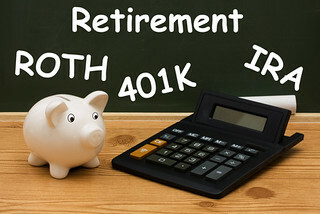 Should I roll my 401(k) to an IRA or leave in my old employers plan? One of the primary reasons that investors open an IRA during the year is to roll their old 401(k) account over when leaving a job. If you are leaving your employer whether to roll your 401(k) balance over to an IRA, leave it in your old employer’s plan, or roll it to your new employer’s plan (if applicable) is a critical decision. Your old employer’s 401(k) plan is lousy (as is your new employer’s if applicable). A desire to consolidate all of your various retirement accounts into a single IRA to make management of your investments easier. Access to a wider selection of quality investment options than might be available via your old employer’s plan. Perhaps you are working with a trusted financial advisor and the rollover with allow them to better integrate this money with your overall investment strategy. The plan offers a menu of low cost institutional investments that might not be available to you via a rollover IRA. This is often the case with very large employers with tremendous buying power, but also with smaller plans who use a competent outside investment advisor. Similar to the last bullet, the plan offers specific investment options that you would be unable to match in an IRA. An IRA, either Traditional or Roth, is a great vehicle to help you win the retirement gamble. Before opening an IRA account you need to do your homework just as with any investing decision. I hope that everyone is enjoying a wonderful holiday weekend. We’ve been watching a lot of college football (Fight-On USC Trojans!) and traveling back and forth between two colleges with our kids. Holiday weekends are a great time to catch up with family and friends. It’s also a great time to review your financial situation. *Net asset value return of the ETF. Your 401(k) plan. By now all plan participants have received the required disclosure from their plan about the fees associated with the investment options offered. While many participants may be inclined to toss this notification, I’d suggest that you take a look at it. How costly are your options? How do the returns stack up against the benchmarks listed? The information provided on the notification is simply a starting point. Take the initiative, do some additional research on your investment options on Morningstar or other financial websites. The websites of many plan providers offer Morningstar data on the investments offered, so that might be a good starting point for you. Your asset allocation. With the nice returns on equities so far this year, your portfolio might be over weight in equities compared to your planned asset allocation. If you haven’t done so in awhile this would be a good time to take a look at your allocations to make sure they are in line. When doing so be sure to take a total portfolio view. Look at your retirement accounts (IRAs, 401(k)s, etc.) as well as your taxable accounts. Consider directing new contributions/additions to your accounts to those areas that are underweight. When buying or selling within accounts consider doing so within tax deferred accounts, or taking losses in taxable accounts if possible. Fund or start a retirement plan if you are self-employed. You work hard for the money you earn. Unlike rank and file employees of a company, you are responsible for your own retirement savings. As soon as you can I suggest that you start saving for your retirement. In some cases an IRA might be the right vehicle. As your business grows you can look at options that allow for greater levels of retirement contributions such as a SEP IRA, a Solo 401(k), or even a Cash Balance Pension Plan. If you are thinking of starting a plan yet this year, consult with your CPA or a qualified financial advisor as the deadlines and requirements for each type of plan differ. If you already have a retirement plan in place be sure to fund it to the greatest extent that you can. Get a financial plan in place. Whether you do this yourself or hire a professional to guide you through the process, there is no better time than the present to see where you stand and how you are tracking towards your financial goals. While this process will benefit you regardless of your age, it is especially critical for folks within 15 years or less of retirement. If you already have a plan in place, review it to see if you are still on track. Remember financial planning is an ongoing process, not a one-time event. Your life changes, you may have gotten married, divorced, had a child, changed jobs or lost a job, or become a widow or widower. Or perhaps your financial aspirations have simply changed. These are all good reasons to develop a financial plan or revisit an existing one. Enjoy your Labor Day barbeque, but take some time in the near future to make sure you are on top of your financial situation.